This winter Western Washington has seen more snow than it has in decades. With the snow comes many applications of salt and de-icer on the sidewalks and streets to be picked up on the soles of snow boots and shoes and carried into your home and onto your floors. What many people don’t realize is that these items used to help give traction in slippery areas can do some significant damage to your flooring if left to sit. Salt and de-icer need to be cleaned right away to ensure your floors do not get damaged. Here are some helpful tips for taking care of salt and deicer inside your home. Regular mopping just won’t do when it comes to dealing with salt, it can leave behind a sort of sticky coating that has your floors attracting everything and becoming dirtier than they were before. The best way to clean up salt is with a neutralizing cleaner. On the pH scale salt products are alkaline and to properly break them down you need a much more acidic or neutral cleaner to break them down, your everyday hard surface floor cleaner is not going to work. In fact, everyday mopping solutions will merely carry and spread the salt product around the surface, thus creating the icky sticky residue. You can find a neutralizing mopping solution at the store or you can go with a green homemade cleaning solution of simple white vinegar. You probably already have it in your pantry. Vinegar is acidic and is effective in breaking down salt products when used correctly. Determine your mopping method. If you are using the good old bucket method you will want to use about four or five ounces of vinegar in 4 gallons of water. For a drier spray and wipe method ( This is the method we recommend because there is less chance of over wetting and damaging the floor. This is especially beneficial for hardwoods.) grab a spray bottle and add a couple of tablespoons of vinegar and then fill the rest of the way with water. Use only vinegar and water do not add in your usual mopping solution. Apply the vinegar solution to the floor and give it just a little bit of time to dissolve the salt product. Be extra careful on wood floors as vinegar should only be used very sparingly and in special circumstances. Do not leave too long on wood floors. Mop the vinegar solution after a few minutes and immediately follow with a plain water rinsing and a clean mop head to remove the vinegar and salt. If salt residue remains carefully repeat the process again. When the salt had been removed follow with your normal mopping method to ensure the floor is completely clean. The best way to keep your floors protected from salts and deicers it to keep as much of it outside as possible. The easiest way to do this is to leave snowy and slushy shoes outside on the porch and get great big high-quality doormats for both sides of every exterior door in your home. 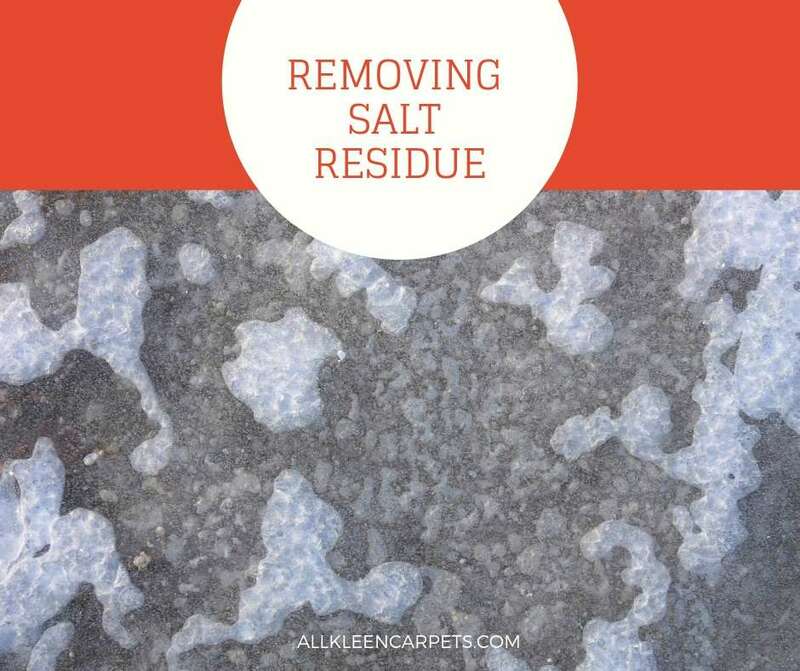 It is also a good idea to have towels and a bottle of vinegar or neutralizing cleaner on hand right next to the door to clean away any salt that does reach the floor before it spreads to a large area. Salt and de-icing products, when left to sit, can eat away at the finish on your floor and cause permanent damage. To keep your floors in their best shape be diligent with the clean-up and prevention of salt products on your floors. If you are unable to remove the salt products on your own don’t be afraid to call a professional floor cleaner in for help. For professional hard surface floor cleaning in Edmonds and surrounding areas make an appointment with All Kleen.